There are many factors that can play into determining the correct type and amount of life insurance coverage for an individual. Every person’s situation, goals and needs are different and therefore there is no simple answer to this question. Nor is there any ready made formula you can use to come up with a magic number. 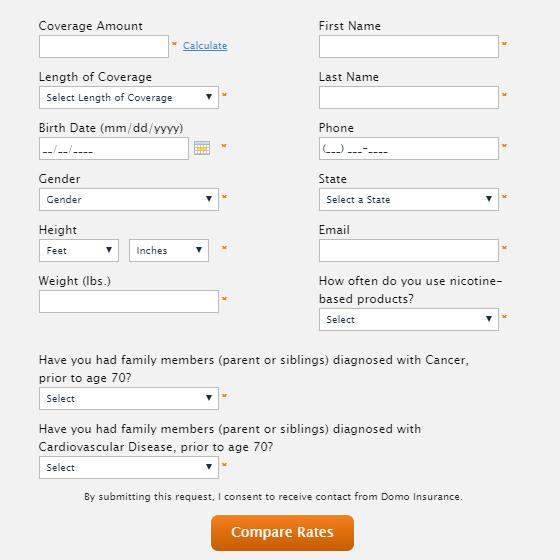 Life insurance “need calculators” that you might find on other sites…that base needs on your age and a multiple of your income are simply gimmicks and are by no mean academically reliable. Many of our clients approach us knowing exactly what they want to apply for, and we simply guide them through the process after applying with the carrier – showing the lowest rates for their profile. Some of our other clients sometimes have no idea where to begin, or have a plethora of questions and ask to be advised. Regardless of which category you fall into, you can be assured that you will be treated with the utmost level of professionalism, integrity and objective respect with a DomoInsurance agent. When you or contact one of our specialists, you will be greeted by an educator not a sales person. This fact will be clear to you right away. It is our mission at DomoInsurance to educate our clients and provide you with all of the resources, information and tools necessary to make an informed and comfortable decision as to the type and amount of coverage that you will put in place. Debt Repayment: If you were to pass away tomorrow what would your families debt picture be like. Is there a mortgage, car loans, credit card debt etc…? Would your family be forced to move out of their home, kids forced to change schools and would the family potentially need to sell off assets in order to meet debt obligations? Income Indemnification: How much income do you bring into the home? How would it change your family’s quality of life and standard of living if that income stopped tomorrow? We typically would advise ideally that 70% – 80% of the insured’s income be indemnified for 5-7 years after death. Education & Retirement Funding: This is the third key area that needs analysis. If you have children that you would like to see go through college; the cost of a portion, if not all, of their educational expenses are typically a concern for a parent. Additionally, do you have a pension in place that will continue to pay benefits to your spouse? When a primary income provider passes, so do their contributions to their family’s retirement plans. You can find more detailed information on the different types of life insurance products under the “products” tab on our home page. Here we will just highlight a few key fundamental points when considering the correct type of insurance. Albeit, your budget with be the major determining factor when considering the type and amount of life insurance you will be able to utilize, you will want to think both short and long term when answering this question. Simply put there are two different types of life insurance. Permanent insurance or temporary insurance, also known as Term insurance. Permanent coverage can be guaranteed to remain in force at a level premium for as long as you live. It is insurance you “own” and can be structured to accrue cash value or not. The cash value would be dollars you can have access to while living. Term insurance on the other hand is temporary in that the premium remains level and affordable for only a specific number of years and then you have to give it back. Term coverage is more like “renting” your coverage. The most expensive way to manage a life insurance program is to buy short term lengths and continue to renew them multiple times over the course of ones life. For example, buying 3 consecutive 10 year terms over a 30 year period will cost thousands of dollars more than had one purchased a single 30 year term right off the bat. This is for different reasons… The 2 main ones are; first, every time a 10 year period is up you are 10 years older, the cost of life insurance increases exponentially with age. The second and probably most impactful is that as you age your insurability declines and your health history becomes more complex. What was once a 35 year old with little to no medical history who had the opportunity to lock in a 35 year olds rate for a 30 year period of time is now a 45 or 55 year old looking for another 10 years of coverage but since they were in their 30’s perhaps they have had a stent placed in their heart, have developed sleep apnea, have developed high blood sugar, High cholesterol, have put on weight etc, etc. Most people go into their first life insurance purchase thinking to themselves, I just need coverage until my kids are out of school, or until the mortgage is paid of. In reality, the need for life insurance does not actually go away, in fact, it just changes. Instead of children’s educations it becomes about indemnifying income or a pension to a spouse, offsetting death, transfer and estate tax liabilities, indemnifying against the risk of increasing health care costs and care needs for your surviving spouse etc… Therefore, in a perfect world everyone would utilize a “laddering strategy” where they own a foundation of permanent coverage and then they would layer cheap term coverage over it to cover the “years of greatest need” which for most individuals is roughly a 20 to 30 year period of time. A simple working example of this is your average 30 year old male looking for 1MM in coverage to cover his mortgage and last until his new born child has graduated college. His years of greatest need are the next 25 to 30 years but neither he nor his spouse like the idea that when the term expires the family is left with nothing. Therefore an excellent strategy for the relative same dollar outlay is to procure a permanent policy for say 250k and a 20, 25 or 30 year term for 750k. The size of the permanent portion of benefit is a subjective one. Some of our clients want to leave millions as a legacy benefit or to offset estate taxes; others are just interested in making sure there is $25,000 to $50,000 for their final obligations and expenses. Allow us to ask a you few important questions to ensure that the quotes we generate for you are both accurate and realistic with regard to your expected rate class assignment. Submit a quick form and review price quotes from the highly rated life insurance companies we represent. If you have a question about any of the life insurance products and services we offer, we would love to hear from you.